Safety is top priority when it comes to climbing. That is why top quality climbing ropes form an important part of any climbing gear. Ropes were the biggest safety risk for climbers until the 1960ies. New high-tech rope fibers and manufacturing techniques for climbing ropes now offer optimized safety. Don't forget your climbing rope if you follow the call of the mountain! What must a rock climbing rope be able to withstand? No Alpine climber should do without excellent quickdraws. In the event of a fall, climbing ropes must have the capacity to lessen the impact force on the body of the climber. Which climbing ropes for what purpose? 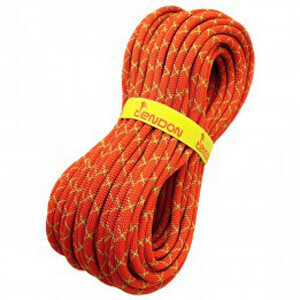 There are countless numbers of different climbing ropes to choose from. At least you might think so at first, but if you really think about what purpose and what requirements your climbing ropes must fulfill, you will soon find the one that is exactly right for you. Single ropes are the most used climbing ropes of all, and with a diameter between 9 and 11 millimeters, they are also the thickest. This single rope with its single strand is powerful enough to hold a lead fall. Half ropes have a smaller diameter of 8 to 9 millimeters, and are also a little lighter in weight. These can be used with the traditional half rope technique or with the twin rope technique. One benefit here in comparison with single ropes is the option to use its full belay length. With a diameter of just 7 to 8 millimeters, twin ropes are the thinnest of all climbing ropes. They are always used in parallel double strands. Their low weight makes them ideal for tours where every gram carried makes a huge difference.